The popular ‘Live Generation’ widget which is available on the Renew Economy home page, has now gone national with the addition of data from Western Australia’s own grid. The widget is a joint initiative between RenewEconomy and Global Roam’s NEM Watch and has been live since early 2015. 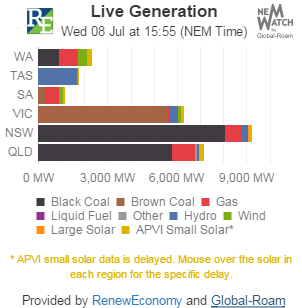 Since it’s launch, the development team have added live solar data (sourced from the APVI’s solar map) and have now added data from Western Australia. Included in the most recent update, is the ability for viewers to include this widget on their own website – users can mouse over the widget on the Renew Economy site to access instructions for how to do this. Giles Parkinson from Renew Economy added “RenewEconomy would like to add its appreciation to the work that Paul and his team have done”.